The Houston landscape today is very different from the landscape that European settlers found when they first arrived in Texas. At that time, the areas around Buffalo Bayou and its many tributaries was a dark swamp populated by cypress and magnolia trees. In many places, the forest was so impenetrable (and filled with mosquitoes) that even the Karankaway Indians would not venture too far in. Over the years, the Houston landscape gave way to industrialization and residential development. It has never lost its greenery or its waterways, however, and today is still home to a wide variety of oak and pine tree species that line the bayous and scenic roadways that connect the outer rims of the city to downtown. Houston’s climate is hot and humid in the summer and temperate and humid during the winter. This makes it very amenable to growing a plethora of both exotic and indigenous plants. Because of this, it also makes it possible for the professional landscaper to provide the homeowner with an eclectic range of options when it comes to styles and types of gardens. Because of our mild winters, we seldom see much freeze damage to plants, shrubs, and trees. In fact, Houston landscapes are known throughout the South for having flowers of some sort or the other throughout the year. There are a number of species, such as pansies and cyclamen, which routinely bloom in the winter. The downside of the Houston landscape is the heavy rainfall which we can receive at virtually any time of year. If the temperature is warm or hot, heavy rainfall will produce outbreaks of mold and fungus within a matter of 24 hours. This is not only bad for human allergies, but for garden plants as well. Steps have to be taken to minimize the impact of mold and fungus on gardens by proactively managing irrigation and at times chemically treating gardens with anti-mold and fungal agents. 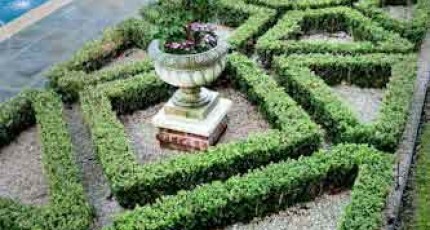 This type of work should never be done by anyone other than an expert botanist who knows the effects of such treatment on each species of plant within the garden, and who understands the impact that irrigation changes may have on the garden as a whole. Throughout almost every corner of the Houston landscape, we find heavy clay soils that pose a number of challenges to gardeners and landscapers. Houston soil tends to hold a great deal of water when it rains. Drainage systems have to be built into gardens to prevent standing water from accumulating around sensitive plants that can die if exposed to excessive water. One method of doing this is to aerate the soil so that water percolates in far enough that it can be absorbed by plant roots and filter down below the harder layers of clay near to the surface. At times, it is necessary to take the clay out to some degree and replace it with bedding soil. Larger gardens or more elaborate Houston landscape projects may require concealed drains that route the water to retention ponds and curbs. Because water cannot always easily filter through the clay soils, they can sometimes be poor in nutrients. Amending the soil may be necessary to enable it to better host a diversity of plant life, or specific exotic plants that require nutrients that do not occur naturally in Houston landscapes. The inconsistent moisture content of the earth here can also cause other problems for landscapers. The expanding and contracting of the earth can actually cause the ground to shift and move. During the summer, the soil dehydrates to the point that cracks often appear in the ground. When sudden rains roll in from the Gulf, the water fills the cracks and causes earth displacement. Structural foundations will be strained as a result, even in the largest of buildings. (This is why foundation repair is such a successful industry here on the Gulf Coast). To compensate for the instability of theHouston landscape, professional designers have to use creative methods to ensure that the outdoor structures they build will remain in place and intact. Patios and pool decks are often built on piers and beams concealed underground. Pools are made with thicker concrete and thicker rebar. While these preventative measures cannot overcome the forces of Nature, they can provide enough of a sturdy framework to maintain the stability and cosmetics of exterior forms.